It is my sincere pleasure to recommend Glenn Hirsch as an outstanding candidate for Drawing/Painting Faculty in Continuing Education. As the Director of Public Education at the San Francisco Art Institute, I have directly supervised Glenn in his role as a Visiting Faculty member teaching Intermediate and Advanced Painting in our Public Education program since 2013. Glenn has been teaching year-round in the Public Education Department for 24 years—beginning in 1994. It has been a privilege and inspiration to work with him as he has developed an unprecedented sense of community in each of his classes—many students returning every semester for the past 5-10+ years to be apart of his course. Glenn is passionate, organized, and goes above and beyond in all areas of his teaching. This extends into the relationships that he has forged with students and faculty on campus. In his more than 25-year teaching career, he has mentored hundreds of students from true beginners to professional practicing artists, and has sheparded close to 100 of them to their next artistic step of attending graduate school. During Glenn’s teaching, he has impressed me with the way he tailors instruction to each student. What strikes me most by the projects his students complete is the high level of ambition and the way that every student is respected and valued despite a strong variety in artistic styles and conceptual approaches. During his interactions and critiques with students, he is incredibly mindful of the impact his words and opinions have on his students, and seems to always know the right questions to ask, and the best way to teach students how to incorporate every technique as a meaningful tool for visual expression. The sheer volume of work that his students make every semester is testament to his motivating force, as many students produce six to twelve paintings in his 12 session class. Glenn cares tremendously about his effectiveness as a teacher and about his impact on the community. He’s the kind of teacher that shows up to every meeting prepared and helps other teachers rise to the occasion. He’s incredibly thoughtful in the creation and execution of his courses, making sure that all of the students’ needs are met, while simultaneously diving into rich and complex content. Glenn is always updating his course content to keep it fresh and meaningful to all students—even for those who have been in the class for a decade or more. He’s able to effortlessly merge technical instruction with conversations about theory that make his courses stand above the rest. I know that Glenn’s commitment to supporting the development of artistic voice in every generation of artist, as well as his strong technical understanding of painting techniques will make him a fantastic addition to your faculty team. If you have any further questions, feel free to contact me at 415.351.3531 or at eshallman@sfai.edu. It is my pleasure to recommend Glenn Hirsch to your program. For more than 20 years Glenn has provided exceptional instruction in the visual art program at UC Berkeley Extension. Glenn is a dedicated and engaged teacher who shares his knowledge of the subject using well-organized course outlines that vie equal emphasis to technique and concept; slide lectures that are found in art historical context; online resources to post weekly slide lectures and samples of student work; field trips to local museums; critiques that offer students constructive feedback; and course discussions that explore process, history and theory. Course evaluations consistently demonstrate Glenn’s responsiveness to the needs of his students, his sensitivity to their diverse levels of experience, and his ability to stimulate creative exploration. He is able to create a supportive environment in the classroom that students respond to positively and which resulted in a loyal following of students that frequently repeated his courses. His support also extended beyond the classroom through his organization of student art exhibits in the campus gallery spaces and by serving as a mentor to individual students in the Post-Baccalaureate Certificate in the Visual Arts. I believe his expensive teaching experience positive attitude and professionalism would make Glenn a welcome addition to any teaching staff. Please feel welcome to contact me directly at 510-664-4004 for further details. Glenn Hirsch is an esteemed colleague and will be sorely missed by his students as well as his fellow teachers. He is always ready to help a student or mentor a younger faculty member. I first met Glenn at a continuing education faculty member in the late 90s and have had the honor of working with him there and then later at the University of California Berkeley Extension. Both he and his partner and fellow teacher, Pam Lanza, are truly committed to their students and often go above and beyond their classroom in order to support and push their students. I often see Glenn and Pam at student exhibitions and openings (sadly few other faculty manage are able to carve that time out of their busy schedules). But we know how meaningful having faculty support outside the classroom is to students and it is that support that Glenn offers. Glenn Hirsch is a legend in the painting studios at SFAI. His adult students return semester after semester to work with him. And he continues to push his students to produce their best work. Many of his students have gone on to the Post-Baccalaureate Program at Berkeley and MFA programs. Glenn would be a welcome addition to any program. Please do not hesitate to contact me if you have any questions; I can be reached at 415.420.1267 or at aberk@sfai.edu. I have known Glenn Hirsch as his direct supervisor since 2002. He holds an MFA in painting, and is technically competent without question. His dynamic personality, supportive and nurturing approach to teaching, and dedication, not only shaped students, but offered much guidance to our organization and department over the years. Glenn brings a tremendous amount of expertise to his painting teaching practice. He has been teaching in our programs since 1993, and is a huge asset to our community and students. He challenges himself to learn and better support students. For example, if a student is deeply interested in painting contemporary landscape, he not only brings in relevant examples of such work, but continues to notice examples in current gallery exhibitions, etc. that might serve as inspiration. He goes above and beyond at every task. When you enter the studio while Glenn is teaching, the first thing that you would notice is the amount of resources that he's brought in and how valuable the students find each moment they have with him. I can't think of a more motivated teacher that is so in love with teaching and supporting students. He's open to feedback and has even taken steps this year to videotape a few of his sessions, allowing him to self-evaluate. He has contributed his insights on teaching in our faculty meetings, helping the next generation of teachers in building their skills. I would hire Glenn to teach a variety of subjects, including portraiture, figure, acrylic painting, painting critique, or collage. I feel honored to have worked with Glenn for so many years, often the same way his students feel. I am glad that he gets to share his gift with as many artists as possible. It is an honor to write a letter of recommendation for Glenn Hirsch. I was a student in Glenn’s “Intermediate Painting” course and his “Exploring the Portrait and Self Portrait” course several times. As a high school art teacher and an art student, I have greatly benefited from Glenn’s instruction. Glenn is passionate about making art, and he is an enthusiastic and positive teacher. Glenn begins each lesson with an impressive slide show of artwork by former students, contemporary and historically famous artists, and sometimes his own artwork. Those fortunate enough to enroll in Glenn’s fall courses are treated to an outrageous slide exhibit of his jack-o-lantern carving skills. Although the prompts are inspiring and instructive, Glenn encourages students to explore their own interests and to make original work. Students have the opportunity to focus on portfolio building in his courses. Glenn continually circulates and interacts with students while they are working. He readily provides feedback and answers questions regarding materials, working methods and subject matter among other concerns. Furthermore, Glenn reaches a wide range of students from undergraduates to retirees; from hobbyists to professional artists. Each course ends with a critique. Glenn is very adept at facilitating student presentations. Glenn’s vast knowledge of art from a historical and cultural perspective provides structure to class discussions. Students learn to analyze and interpret art on many levels, including its compositional, narrative and expressive qualities. Students learn about self and peer evaluations in Glenn’s courses. Lastly, Glenn is professional. He treats students with respect. He is clear about learning objectives and class expectations. He closely follows his syllabus which is posted and available to students at the beginning of each term. He communicates with his classes regularly via email, reminding them about homework and answering questions. He promptly responds to emails. He also keeps students abreast of current events and exhibits in the art world. Glenn is an excellent art teacher. He encourages students to explore their creativity and find their artistic voice. His love and enthusiasm for art is prevalent in the classroom. I highly recommend Glenn to the position he might be applying. I think he would be a great asset to any institution. University of California, Santa Cruz, Ca. Art is a combination of technique and surprise in the service of a vision which can only be discovered through curiosity, concentration, and confidence. Students are encouraged to work on several pieces at once, since this allows for more freedom to experiment. Assignments train the eye and hand but with the flexibility to also find the heart. Feedback is specific but open-ended. How can a piece be made stronger? Or taken in new directions? What was the initial vision and what does the work say to the artist now? Boxes of books form a centerpiece in the studio offering the art of world cultures stitched together in myriad ways. Weekly slide lectures develop each student's independence by providing a verbal vocabulary for visual thinking. The studio is a safe place to take risks. Group crits create a synergy in which ambition can flourish. Students feel they are part of a provocative conversation -- technical, conceptual and personal. 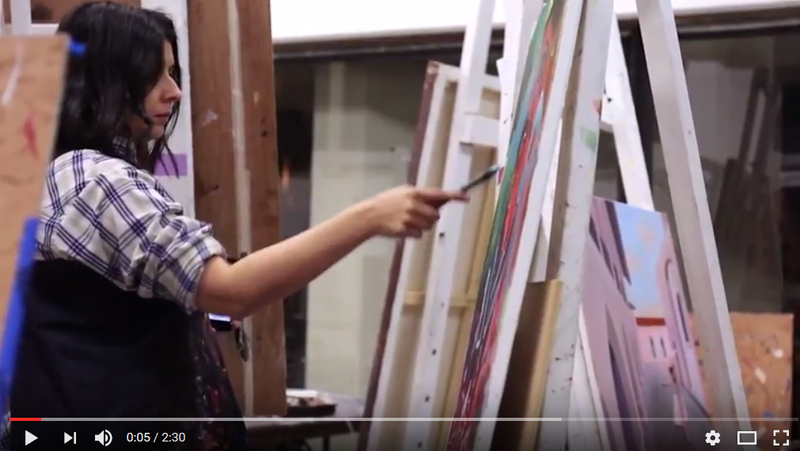 YouTube excerpt from critiques in the "Intermediate/Advanced Painting" class at the SF Art Institute (review of paintings by Joseph Hovadik) - click here and here and here. "What Painting Can Teach You About Pivoting." I learned these lessons from Glenn Hirsch, a painter who teaches an advanced painting class at the San Francisco Art Institute (SFAI) through its adult continuing education program. I credit painting with giving me the courage to pursue a more creative career. It can be paralyzing standing in front of a blank canvas, especially if it’s big. It’s thrilling to have a big idea or a big canvas in front of you, but the bigger the canvas the harder it is to make that first brush stroke. Painting teaches you that no matter how big your canvas (or idea) you have to start somewhere. Make that big bold gesture across the canvas, or start with a corner. It doesn’t matter; it will likely get covered up at some point. Some painters start by painting their canvases brown or gray. It’s just a foundation that’s going to get covered up but it makes the next layer and the next, easier to paint. Painting like any other creative endeavor such as building a company is about harnessing creativity and turning into a discipline. Some days painting is effortless, and other days, you lack inspiration and motivation, and picking up a paintbrush is difficult. Building a company is much like this. Some days are euphoric and other days everything goes wrong. It’s important to stay focused and disciplined and work through these days. Good painters paint every day whether they feel inspired or not. (3) Facing fear and failure. Every artist from Monet to Michelangelo has discussed the struggle they experienced through the creative process. Every painter comes face to face with paintings they don’t like, and creates work that no one will see or paintings that are never finished. Every painter fights the fear that his or her work will not be liked, and that they will fail. Painting requires working through these fears and continuing to create. Failure results when you quit, and learning to keep going in the face of fear and doubt is perhaps the most important lesson a painter learns. Many artists paint in series and paint multiple canvases at one time. Painting in series has a lot of benefits, but one of them is the ability to take risks, step outside your comfort zone and try new things. Risk-taking is often rewarded in painting, and it is the canvas that you throw paint at that might result in a one-man show at an art gallery. While you want to focus on your core mission at a startup, don’t let it keep you from taking risks and experimenting. Step back. It’s easy to get stuck in the details of a painting, but it’s always important to step back to see the big picture (pun intended). Look at it from different angles and turn it upside down. Another great thing to do is to cover up a piece of it that wasn’t working to be able to see the rest of it. Holding up a book to cover up the left side of your painting might reveal that you’re onto something brilliant on the right. Stepping back lets you see things more clearly. It lets you see what’s working and what’s not, when to charge forward, when to make changes, and yes, when to pivot.